A GUIDE TO CHOOSING THE RIGHT 3D PRINTING FILAMENT: ABS VS PLA PART 1._FAQ_Shenzhen Affinity 3D Printers Intelligence Technology Co., Ltd. In this article we will analyze the different types of 3D printing materials to help you make a correct decision when in search of the best 3D printing filamentfor your future printing project. In 2015 3D technology has revolutionized the way 3D printing is perceived by consumers. It is believed that 2016 will bring new achievements to the 3D printing market, gaining more popularity and extending its presence in other human spheres of activity. As we already know, 3D printing is used from machine manufacturing, to jewelry, to home articles and game models printing. Nowadays there are various 3D printing materials that 3D printers support, such as plastic, metal, to ceramic and even wood based. WHAT IS A 3D PRINTING FILAMENT? 3D filaments are plastic-based materials that are used in consumer 3D printing due to their cheap price and easy handling. There are different types of plastic-based 3D Printer Filaments, such as ABS, PLA, nylon, PET, HIPS/PVA, with the first two being the most widely used in home-based 3D printers. These build materials come in a rainbow of colors; so you, as a consumer, have a wide spectrum of choice when it comes to preferred color for your printed object. In this article we will analyze the two most popular 3D printing plastic filaments for consumer 3D printers. ABS (Acrylonitrile Butadiene Styrene) has been the most popular plastic material used in 3D printing until PLA came in. However, it is still extensively used build material for desktop 3D printers. ABS has also the property to dissolve in acetone (nail polish remover). Acetone solution can be used to polish the ABS printed items. Under the action of acetone the outer layer of the model melts, it smooths out, gets a special shine and the layer pattern of the printed model becomes invisible. 3D model printed on ABS 3D printing filament. It is recommended to print ABS models on a heated build plate, as the thermoplastic material has the ability to contract and bend when cooling down too fast. The build plate temperature ranges from 50° to 100°. It is also advisable to use enclosed heated chamber to print ABS items, allowing them to gradually cool down during printing, thus avoiding shrinkage of the item. There are few special effects ABS materials available on the market. Here are two of the most popular ones. Glow-in-the-dark ABS. The glow-in-the-dark ABS filament contains phosphorescent particles that make the printed item glow when exposed in the dark. Actually, the phosphorescent particles absorb the energy from a light source and release it slowly when in the dark. This type of filament is no different from the standard ABS build material. It is fun to work with, it doesn’t require special printing configurations and it is handled just as a standard ABS material. 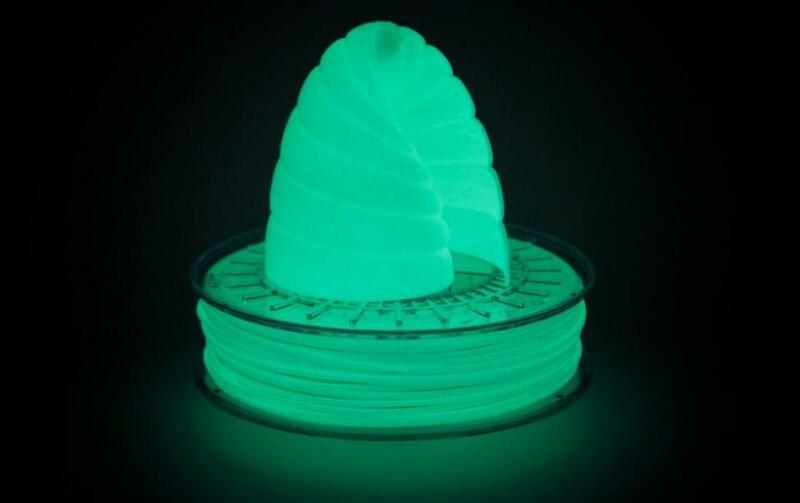 The ABS glow-in-the-dark filament is available in several colors; however, it is said that green glow-in-the-dark ABS yields best glowing results. The glow-in-the-dark ABS filament is usually used to print toys. Smart ABS 3D Filament. This type of 3D material promises to cause 30% less warping in your printed items and better layer bonding. Otherwise, it has similar properties as the standard ABS. Also, this type of filament is not available in a lot of colors. PLA (Polylactic Acid) is probably the most commonly used 3D printing plastic material for home-based 3D printers, together with ABS. It is also considered the most eco-friendly built material for 3D printing. It is manufactured from corn starch and sugarcane, which makes it safer to use, as it releases no health-damaging substances at high temperatures. Due to its organic composition, PLA has a sweet material smell. PLA build material doesn’t dissolve in acetone (it can be processed with special fluids only: phenol, limonene and concentrated sulfuric acid). It is a better option for those who want their item printed at a higher speed and with smoother layers. With appropriate printing configuration, PLA can offer better handling of details. It is also the best option to print moving parts. PLA can also be mixed with various materials to obtain different finishes, such as wood, bamboo, metals and other special effects substances. The new blends retain the properties of the standard PLA thermoplastic. Wood PLA. The plastic material is mixed with wood fibers. This type of filament is available in different colors, depending on the wood fiber source it is used to blend it with (lay, cherry, coconut, pinewood). 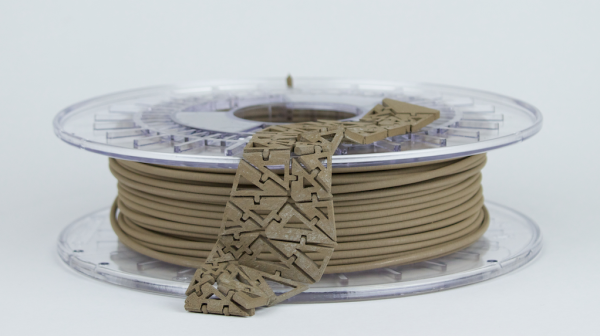 PLA plastic filament for 3D printing mixed with wood fibers. Bamboo PLA. 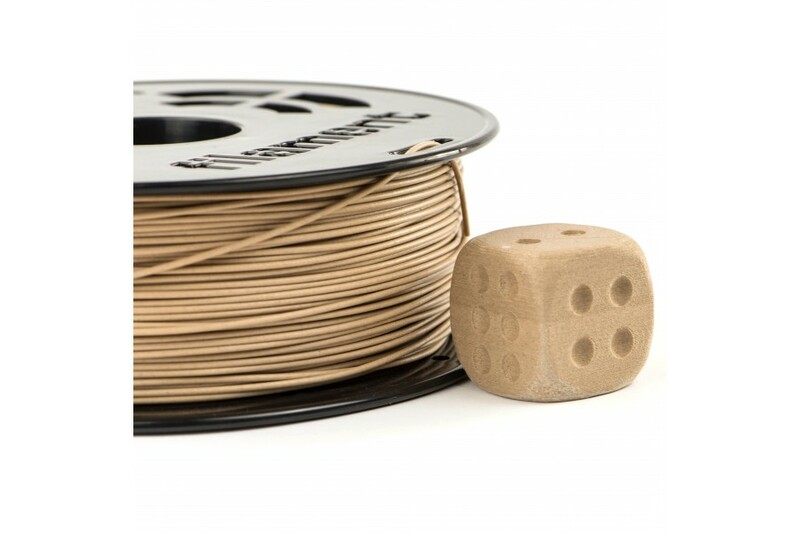 This filament blend contains 80% PLA and 20% recycled bamboo fiber. 3D model printed using PLA Filament plus bamboo fibers. 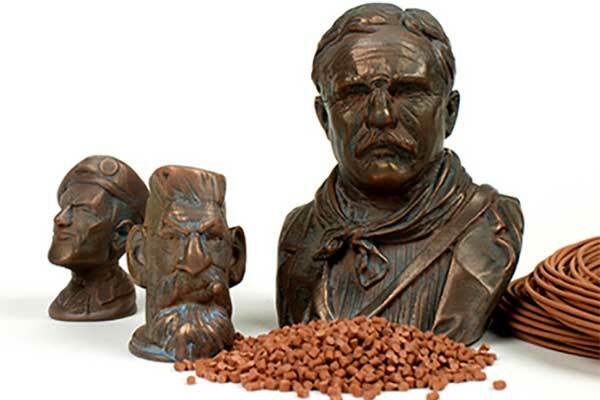 Bronze PLA. 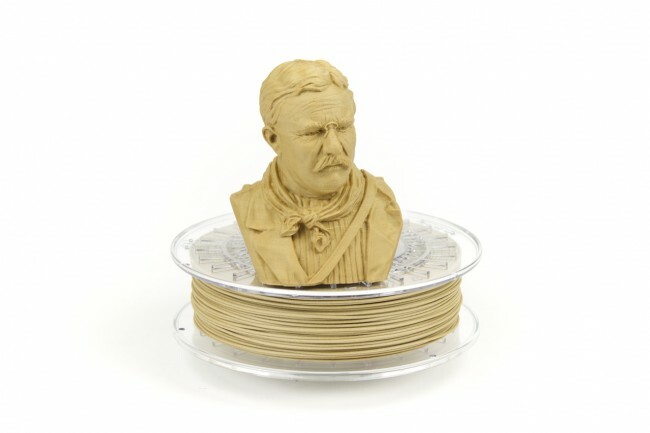 This PLA plastic 3D printing material is mixed with bronze powder. It gives the printed item a golden look after polishing. A 3D model printed out on PLA 3D Filament mixed with Bronze. Copper PLA. This material contains small particles of copper. After polishing, the printed item will have a shiny finish. PLA+glow effect. This filament contains phosphorescent pigment which will make your models glow in the dark. A 3D model printed on PLA 3D filament with glow. ABS and PLA filaments are known to attract water from air. The water particles can cause brittleness, filament degradation and even breakage, which can complicate the printing process. Therefore, a proper storage is required to prolong your build material’s shelf life. It is recommended to store the filaments you are not using in vacuum bags. They are known to support a void environment, free of air humidity and impurities. To make this storage procedure more effective, it is advised to throw some silicagel pads in the vacuum bag, to absorb the moisture from the air it remained after the bags have been vacuumed. PLA is a less flexible plastic material than ABS. Printed items have a more pronounced shiny finish and smooth surface. However, more effort is required to clean up the printed object. Also, low glass transition temperature won’t allow using the PLA printed item in areas with direct sunlight or close to heat sources, as they can heat up and lose shape. PLA 3D filament allows printing at a higher speed, with a thinner layer and high-detail fidelity models. It is the perfect printing material for hobby, home and education purposes. ABS is a strong and flexible plastic material. It smells bad when heated and it needs a heated build plate during printing. These properties make quality printing impossible for some 3D printers. ABS printed objects are easily cleaned up with a simple sand paper and the object becomes smoother. Also, the glossy look is obtained either by wiping the printed item with a cloth moistened with acetone or using acetone bath method. ABS is also easier to be processed repeatedly than PLA and the material won’t lose its properties. This being said, PLA is the perfect 3D printing material for hobbyists and home 3D printer enthusiasts, while ABS, due to its properties, is recommended to professional engineers and manufacturers for high quality prototype production. 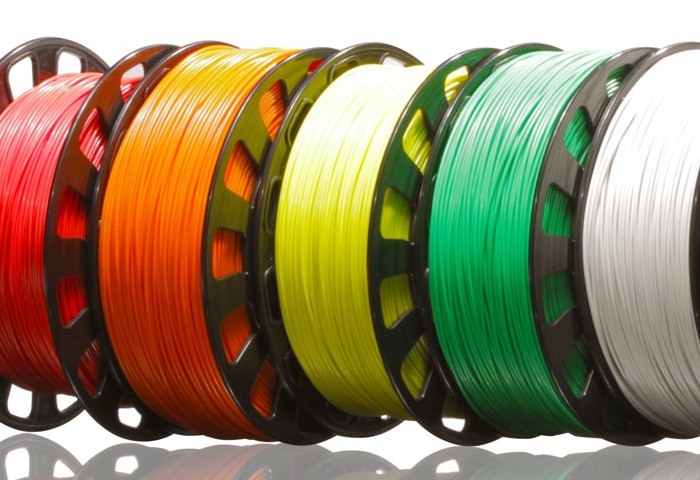 Choosing the right 3D printing filament for consumer printers is less complicated when you know the advantages and drawbacks of each of them. 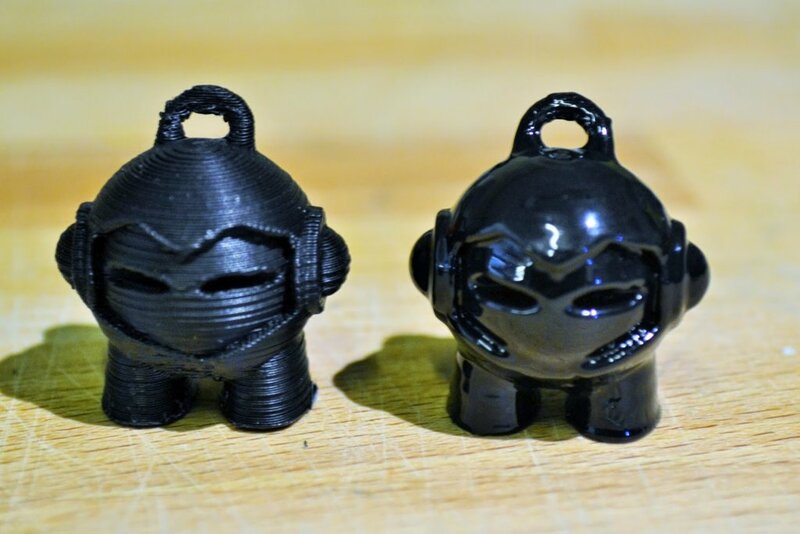 We hope our comparison of PLA and ABS 3D plastic filaments will be of great help for you. If you know any other features of these 3D printer filaments don’t hesitate to share them with us in comments below!